Neurosurgeon Dr. Anant Patel, who is affiliated with St. David’s North Austin Medical Center, and Neurology Solutions Movement Disorders Center Medical Director Dr. Robert Izor are at the forefront of a less invasive, more precise Deep Brain Stimulation implant procedure. The new surgical technique streamlines the process for undergoing DBS surgery—requiring one less procedure and five fewer incisions. The new Deep Brain Stimulation (DBS) implant technique uses the latest integrated surgical and interoperative programming equipment, StealthStation™ and O-arm™, developed by device manufacturer Medtronic. The technique eliminates the need for placement of bone marker screws prior to DBS implant, a procedure that takes between three and four hours. Called “fiducials,” the markers—one on both sides of the skull and three in the posterior vertex—are placed into the patient’s skull to guide the surgeon in implanting the Medtronic DBS electrodes. Prior to Deep Brain Stimulation implant, the surgical team will use imaging technology to develop a platform, called NexFrame, that is linked with a neuronavigation system to provide a high degree of targeting and stability during surgery. The platform is constructed using the patient’s CT and MRI scans that identify the exact spots in the brain that need surgical intervention, usually within 1 mm of the locations identified for treatment. The latest version of Medtronic’s neuronavigation system, StealthStation S8 surgical navigation system is a precise pre-operative modeling technology used for planning the surgical approach for each case. It allows surgeons to visualize structures and anatomy quickly by merging images from CT, MRI, PET and other imaging technology into a blended 3-D model. Due to the accuracy of the imaging, the navigation platform allows the Medtronic DBS procedure to be done without the physical landmark of fiducials. The O-arm surgical imaging system provides real-time, intra-operative imaging of devices such as DBS leads, microelectrodes, depth electrodes, and biopsy needles. Combining O-arm 3-D imaging with image fusion on the StealthStation allows the surgical team to confirm they have achieved optimal DBS placement during the surgery. 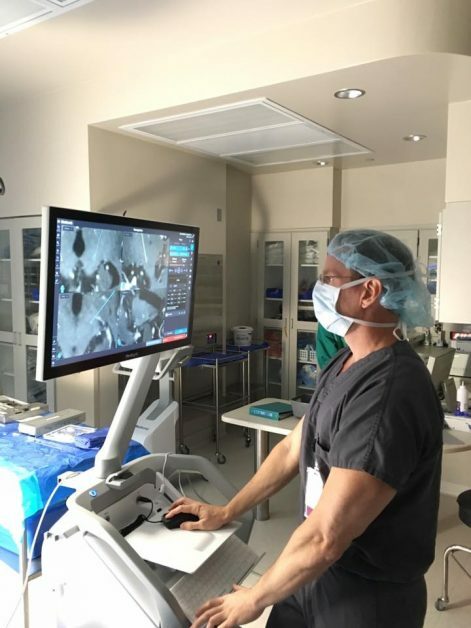 St. David’s Medical Center in North Austin and Round Rock are the only centers in the country currently using StealthStation, O-arm and NexFrame for patients undergoing DBS. St. David Medical Center is one of the most highly sought after training institutions teaching the Medtronic fiducial-less DBS procedure, according to Medtronic DBS consultant Damon Dennett. Due to their extensive experience in Deep Brain Stimulation implants and programming, Dr. Patel and Dr. Izor were certified as part of the Medtronic Visiting Clinician Program Site program. St. David’s North Austin Medical Center is one of a handful of sites that provide neurologists and neurosurgeons training in using the equipment to plan and perform the DBS implant. The center performs all DBS surgeries with both doctors present, Dr. Patel performing the surgery and Dr. Izor guiding the lead placement and programming. Neurology Solutions has extensive experience in DBS lead placement and programming. Dr. Izor is a neurologist and fellowship-trained movement disorder specialist who practices at St. David’s North. Since 2004, Dr. Izor has participated in DBS implant surgeries and programming of nearly 300 DBS patients in the Austin area. Neurology Solutions sponsors a monthly DBS Learning & Support Group in Austin with the Capital Area Parkinson’s Society. A comprehensive movement disorders center, Neurology Solutions offers therapeutic drug and surgical therapies, nutritional counseling, supplement therapies and an on-site physical therapy center providing physical therapy/sports medicine, occupational therapy, and cognitive and speech therapy for movement disorders. DBS surgery often helps significantly reduce tremors in patients as an essential tremor treatment as well as tremors and other symptoms of Parkinson’s disease (PD) and dystonia. DBS also can reduce the need for medications, many of which cause side effects such as involuntary movement. In one study, 87% of the individuals who had undergone DBS showed improvement in motor control within one year after surgery. There is research suggesting that DBS also may slow the progression of Parkinson’s Disease. According to a 2014 report in Neurology Reviews, animal studies suggest that DBS of the subthalamic nucleus protects “against the progressive loss of nigral cells” associated with PD. Besides potentially slowing progression of the disease, the deep brain stimulator can provide a steady dose of electrical medication that is helpful with managing the on-cycling and off-cycling, or “peaks and valleys,” of oral medication. Neurology Solutions is accepting new patients seeking a specialist in managing Parkinson’s disease, dystonia, essential tremor and age-related movement disorders. If you are looking to confirm a diagnosis or find different treatment choices for managing symptoms of a movement disorder, please contact Neurology Solutions or call 512-865-6310 to schedule an appointment.